Photos and story by Greenwood-Phinney Greenways. In celebration of Earth Day, Greenwood-Phinney Greenways and Licton-Haller Greenways held a lively and well-attended community service event where neighbors were able to “reveal” and clear off a significant stretch of sidewalk along the west side of Greenwood Ave North, between North 120th Street and North 122nd Street, previously buried under gravel . 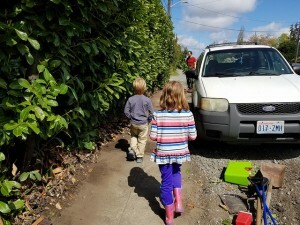 Fixing a cluttered, impassable sidewalk may seem like a small victory, but it points to a much larger issue for many of the neighborhood streets in the Greenwood area: that is, the lack of safe and comfortable sidewalks for kids walking or biking to school, people walking to the bus stops, library patrons, and seniors on scooters or in chairs attempting to get home. 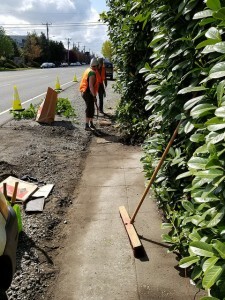 Other common sidewalk impediments in the area include large scale, overgrown laurel hedges that block pedestrian right-of-way, apartment building parking, and other vehicle parking that are frequently encroaching on the would-be public walkway. Local traffic in the area is fast and dangerously close to those walking along Greenwood Ave North. 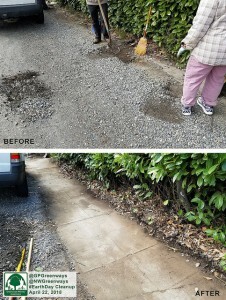 Safety enhancements for people who walk along Greenwood Ave N were envisioned in the Move Seattle Levy. While improvements have been made south of North 112th Street, and more are coming north of North 137th Street, this middle stretch between the two is glaringly lacking in even rudimentary sidewalk access—a condition that falls short of Seattle’s own Complete Streets policy. 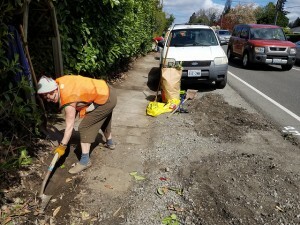 The Greenwood-Phinney Greenways group, a member group of the Seattle Neighborhoods Greenway coalition, is hoping that the City will step in to “daylight” the existing sidewalks in this part of District 5, and that the overgrown vegetation is cleaned up to provide a temporary solution for pedestrians on this stretch of Greenwood Avenue. The Greenwood-Phinney Greenways group is continuing to meet with city leaders to discuss ways to fund and implement more permanent improvements to provide safety and accessibility for all users on this important corridor. A Seattle Neighborhood Greenways citywide priority is the conversation about how pedestrian projects are funded and constructed. 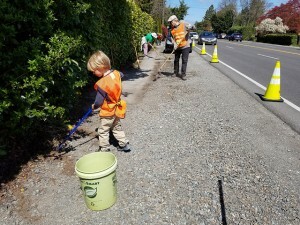 The Greenwood-Phinney and Licton-Haller Greenways groups are working on making Greenwood Ave North an example for the city. Inspired by this community-driven success story? Pitch in to help make more outcomes like this possible.